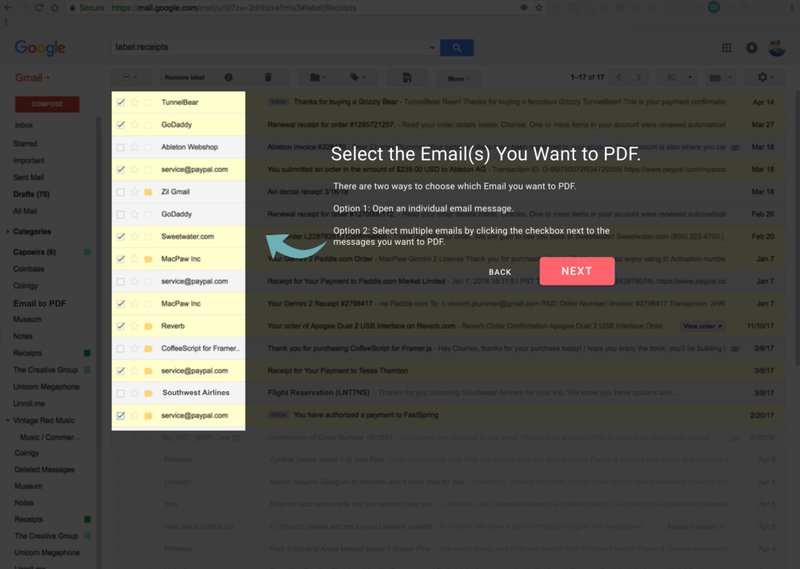 Email to PDF is a chrome extension for Gmail that allows a user to select messages (single or in bulk), extract attachments, and download them as PDFs. Fix account creation and grow existing user base. After performing a deep dive analysis on the quantitative data (using Instapage smoke tests, FB Ads & Google Adwords) and qualitative data (from user interviews - I used Respondent.IO to recruit participants) we were confident in our decision to build Email to PDF. We used Realtime Board for affinity mapping and general team synthesis. One of our users from an early round of smoke test validation (Brooke)mentioned that she liked the coral color and it inspired a theme of an sea theme. 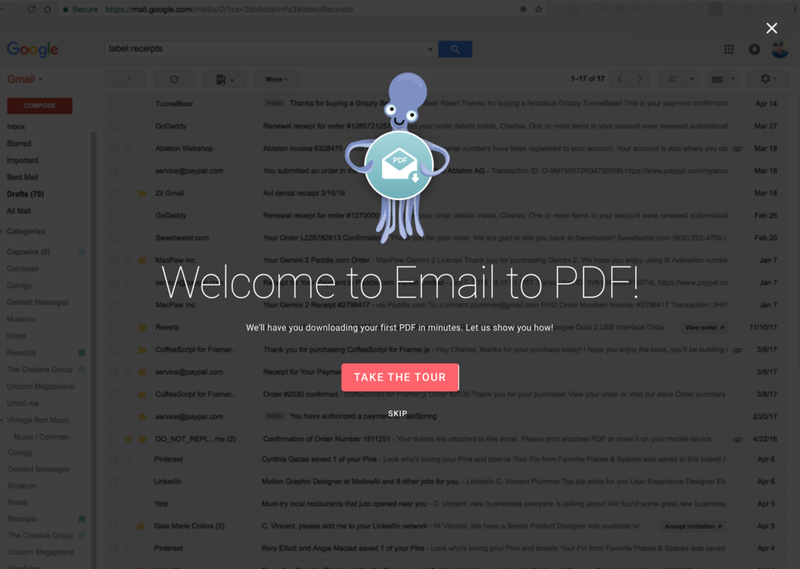 An octopus, busily converting emails to PDFs, seemed like a fun consumer mascot for this product. After riffing with the design team, a pretty thorough round of internal testing was done on a handful of logos and a winner emerged. It was a good opportunity to better understand grid systems and responsive layout with a more formulaic approach. This enabled our team to move faster instead of having to build each asset from scratch. Based on the research, we discovered two pain points that will help inform our positioning and marketing of the product. Offline access vs. Migration / Downloading in large chunks. I created two primary personas to design for. Brooke the business woman, and Daron the downloader. Brooke's primary issue is offline access when she travels for work. Daron's primary issue is his desire to download and backup large amounts of emails, documents, and attachments for both business and personal reasons. There is an overlap in the two personas that we believe we can address for Gmail users, but there is an opportunity to address more people like Daron with an app that has access to older email service providers like Aol, Hotmail, Microsoft, etc. That is the primary location that Daron is trying to migrate and download from. We used real time board to collaborate and agree on a flow. The intention was to test a chrome extension in the market prior to launching with other email service providers. However, Google made a decision in mid November 18’ to limit access to inboxes with their new API policy framework. Regardless of our teams commitment to being incredibly transparent at safeguarding anonymized and redacted user data, this was a pretty disruptive force and caused us to pivot in a different direction.